Internet opens door of commercial opportunity to rising number of disabled entrepreneurs. Li Li in Beijing reports. Every day, Zhang Yuncheng is up at 9 am to run his online shop. He updates product information, responds to inquiries, checks deliveries and reads comments left by happy customers. And he does it all with just one finger. The 30-year-old, who was born with progressive muscular atrophy, is completely paralyzed from the neck down apart from the middle finger of his right hand. "My Internet shop keeps me busy," he said. "Without the Internet, I can't imagine what I would be doing now." Zhang is one of about 10,000 disabled entrepreneurs who have registered stores with Taobao, China's largest online marketplace, since September 2009. A spokesman for the company estimated that the total number is much higher. "We've noticed an increasing number of disabled people working online," said Xu Junxing, editor of China Disabled Persons' Network, a popular website run by the China Disabled Persons' Federation. "The Internet is providing some big employment opportunities for them." Zhang set up Pengcheng E Buy in 2005 with his brothers, Zhang Yunpeng, who also has progressive muscular atrophy, and Zhang Yuncai. By controlling a mouse with his finger, Zhang Yuncheng uploads and arranges sales information and liaises with customers, while 34-year-old Yunpeng paints Chinese traditional prints with a brush in his mouth to sell online. Yuncai, 36, handles logistics, finding suppliers and purchasing goods. The business is run from a two-bedroom apartment in north Beijing and sells anything from women's clothes and cosmetics to bubble wrap. Since 2007, when monthly turnover surpassed 10,000 yuan ($1,500), the brothers have been doing a roaring trade. The store enjoys a 99.9 percent "good" rating from Taobao customers and is ranked "five diamonds", which means it has successfully completed 5,000 deals. As well as revenue from the shop, which is now the main source of income for their family of six, the brothers also rake in extra money supervising a bulletin board for a popular virtual community. Their success is a far cry from when they arrived in the capital from Northeast China's Heilongjiang province in 2004. Yuncai originally attempted to juggle life as a full-time carer with odd menial jobs, such as working as a delivery boy and selling vegetables. Yet even spending a short time away from his two paralyzed brothers was proving potentially hazardous. He recalled that Yunpeng once accidentally tilted his head and was forced to remain in an uncomfortable position for two hours until his brother returned home. "I couldn't leave them at home by themselves, so we had to come up with a solution that didn't involve me going out," said Yuncai. When a friend offered to teach them how to build and run an Internet shop on Taobao (the company also offers free technical support to disabled users), Zhang Yuncheng said he felt "a tickle in his heart". Today the brothers are role models for millions. They frequently share their experiences with anyone who contacts them for advice and even help raise money for other disadvantaged groups. One of Yunpeng's paintings was sold for 100,000 yuan at a charity sale to support victims of the snowstorms in 2008. The money went to a school for disabled children in Changsha, Hunan province. Zhang Yuncheng was also given a special award to celebrate his business success in 2007 by Jack Ma, chief executive and chairman of Alibaba Group, which owns Taobao. "The doctors told me people with progressive muscular atrophy only live to the age of 28, but look at us now," said Zhang Yuncheng, as he shared a smile with his elder brother. With the power of the Internet, the brothers have been transformed from burdens into breadwinners, and Zhang Yuncheng said he hopes his story will inspire more people to help themselves. "The Internet can offer disadvantaged people more possibilities in life," he added. For disabled people looking to boost their job opportunities, help is also at hand from several voluntary groups. One of the biggest is the China Taobao Disabled Alliance. 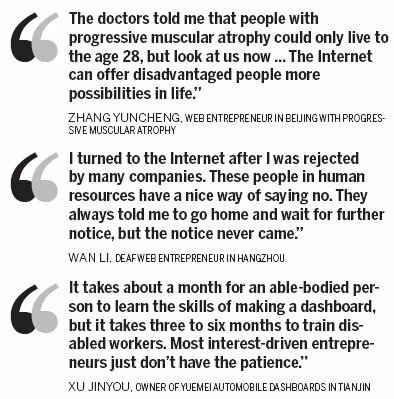 "There's great interest in learning the Internet business among disabled people," said Lu Xing, who heads the alliance from his home in Hefei, capital of Anhui province. The 35-year-old, who is deaf, opened a Taobao store in 2009 and soon became an online sales agent for Lenovo laptops. He recalls that, during regular visits to websites for deaf and mute people, he noticed bulletin board comments like "I wish I understood the Internet business" and "I want to open a shop on Taobao". To cater to the great demand and help with the free exchange of information among the disabled, he built an online communication platform last year for group chats. "Our alliance has quickly expanded to more than 200 members," said Lu. "About 10 percent are physically challenged, while the rest are all deaf mutes." Most members have already opened online shops and keep each other company every day by chatting while managing their businesses. The alliance has become vital to many newcomers as it allows them to access a wealth of information, from reliable suppliers to shop decorations for their virtual storefronts. Kong Qingfeng has also started a similar online business group called Disabled Family. "Together, we can form a bigger Internet company and even register a brand to attract suppliers," said the 24-year-old, who suffers from ankylosing spondylitis, a disease that affects the spine and can cause immobility. "One day, we can take the business to the real world and help more disabled people get jobs." For Chinese people with mobility problems, Web businesses are a good alternative to the mainstream labor market, which experts say is still fraught with discrimination. "I turned to the Internet after I was rejected by many companies," said Wan Li, 39, a deaf Web entrepreneur in Hangzhou, capital of Zhejiang province. After eight years of education at a school for the deaf, he was found assembling radios at a local factory. However, the 600-yuan monthly salary was not enough to support his family, especially after the birth of his son, so in 2007 he quit with the intention of finding a better job using his computer skills. It was harder than he had expected. "These people in human resources have a nice way of saying no," said Wan, as he recalled his job-hunting days. "They always told me to go home and wait for further notice, but the notice never came." He said he is more than capable of working in a job that involves a keyboard or as an office assistant, yet companies turned him down because he is deaf. "Why would they want me when they have enough healthy people to choose from," said Wan, mockingly. He now owns two successful online stores selling cloth bags. "I'm making 10 times more than I used to," he added with a proud smile. Yuemei Automobile Dashboards, a private company in Tianjin about 100 kilometers from Beijing, has been recruiting disabled workers for its production line since 2005. Today, they account for almost half of its 47 employees. "It takes about a month for an able-bodied person to learn the skills of making a dashboard, but it takes three to six months to train disabled workers," said company owner Xu Jinyou. Apart from the difficulty involved in training, he said the lower productivity of disabled workers also adds more financial pressure to the business. "Most interest-driven entrepreneurs just don't have the patience," he added. The reality has driven a large proportion of disabled people away from the job market and towards self-employment. Selling products on the Internet is the easiest and most popular option, as startup costs are low. It is not necessarily the most suitable, however. 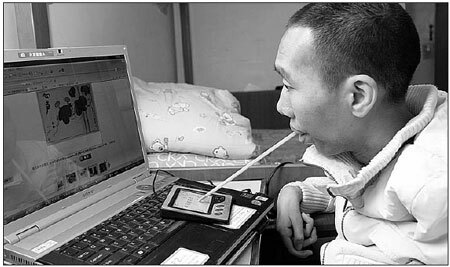 "Hours of concentrating on a screen can take a heavy physical toll on disabled people," said Xu Junxing at China Disabled Persons' Network, who explained many suffer from deteriorating health. She said a large number give up after a few months of running an online shop, usually because of poor choices in suppliers and products. "It takes not only passion but also business knowledge to run a successful online shop," she added. Her website offers business consultancy services to many disabled netizens, with training in computer and other skills provided by the China Disabled Persons' Federation. "However, the ones who find employment on the Internet make up just a small fraction of China's disable population," said the website editor. "Most disabled people are taking low-level jobs or are unemployed." The country has about 83 million disabled people, including more than 7 million capable of working, according to the China Disabled Persons' Federation. However, fewer than 3 million actually are employed.